Easily add video, pictures & links to your posts. You can even upload videos to your YouTube channel. Keep visitors on your pages with Sociamonials share buttons. The entire experience is on-page. Account monitoring throughout the day alerts you if any social network drops the API connection, which can cause messages not to post. Moderation of user-generated content allows you to build engaging galleries of user videos, photos and messages without the embarrassment of associating inappropriate content with your brand. All links generated from Sociamonials are shortened and tracked. Lead conversion tracking allows you to report on white paper downloads and email newsletter signups. Revenue tracking allows you to report ROI on your social activities. Profanity filter protects your brand. Asset library allows you to store brand assets in the cloud for quick use in your campaigns and share buttons. 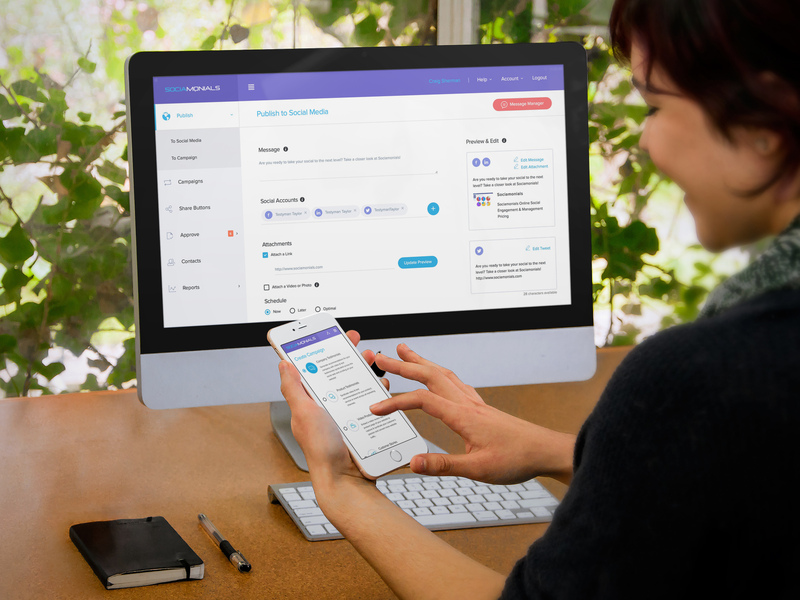 Social CRM tracks customer activity across all social touch points, including interaction with published messages, share buttons and campaigns. Provides engagement and referral rankings to quickly identify key influencers. Integration with popular CRM and email service providers. Customer database encryption helps meet new corporate data security regulations. Schedule posts based on highest clickthroughs, lead conversion or revenue. Every post includes a verification report that confirms that the message reached the social account successfully. Links to the live post are provided. If message has an issue, your user will be notified via email with tips to resolve issue. Automatically shortens and tracks up to 5 links per social post. Each shortened link passes detailed post information to your analytics provider. 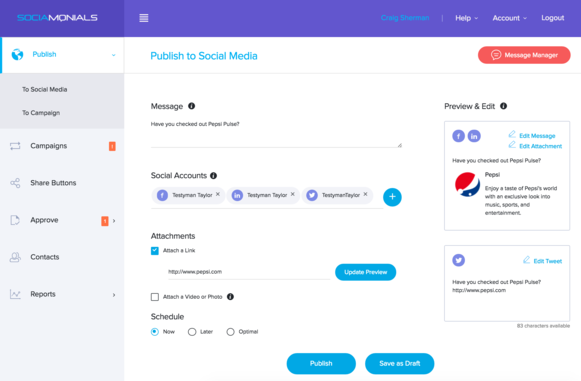 Preview precisely how post will appear on Facebook, LinkedIn and Twitter and make edits to each network separately for calls-to-action that are more relevant to each network. Advanced video management ensures that your videos play within the news feed. You can attach a video that is already online, upload a video file or create a new video by recording using the built-in recorder. The video will upload to the YouTube channel you specify, then publish to the social networks you specify all in one step. Email notifications of scheduled message postings. Save messages as draft for future completion. Automatic archiving of all sent messages. Open any archived message as a new post to save time on reposting. Route posts for approval automatically based on user role permissions. Manage unlimited Facebook, Twitter & LinkedIn accounts via your Sociamonials account (varies by account level). Custom campaign design. WYSIWYG editor allows marketing personnel to create beautiful designs without writing a single line of code. Choose from a number of design templates and background images to create an agency look in minutes. Custom Email Notifications - WYSIWYG editor allows you to match your email notifications to your brand so it appears that emails are coming from you. You can even add personalized fields and attachments. Create a separate email for each step of the submission process, including: Thank you for signup up, internal email notifications, your submission is approved, voting is open/don't forget to share, etc. Custom submission forms - Drag and drop simplicity allows you to quickly build custom forms to capture the information you need. Block search engine crawling or customize the SEO tags for each campaign page for maximum exposure. Tracking & Retargeting Tag management. You can setup AdRoll retargeting campaigns that encourage visitors to come back and submit if they do not complete the form submission process of any campaign. API Integrations - Choose your email provider and list. Form submissions will automatically be added to your email provider. Award additional entries for referred sweepstakes entries, referred leads & sales, referred online store visits, video submissions and bonus entry codes. Sweepstakes console provides detailed entry information about each contestant and a history of their activity as well as information about their IP address, like city, organization, etc. Sociamonials randomly selects recommended winners based on the number of eligible entries. You declare one or more winners for each winner selection period and it is stored in the system for future auditing in case of a challenge. 16 campaign types to choose from to drive loyalty, engagement and referrals from your followers. Video and text testimonial management. The only system with a streaming video recorder. Also the only system that allows video submission via email attachment. Quickly add testimonials to product pages, landing pages, etc. White label (Enterprise accounts only) allows you to remove Sociamonials branding from campaigns and share buttons, even the authentication screens. Mobile Responsive Microsite - A shortened link and QR code is provided to an engagement page that looks beautiful on any device. Company website and blog (popup) - Add campaign as a popup with no coding required. Configure easily with options like only popping up on first visit, delaying popup until user attempts to exit page, and fly-in effects. Company website and blog (sticky tab) - Add a fixed position tab where you specify with the look and feel that matches your brand. Options include opening then closing automatically, only on first visit, etc. 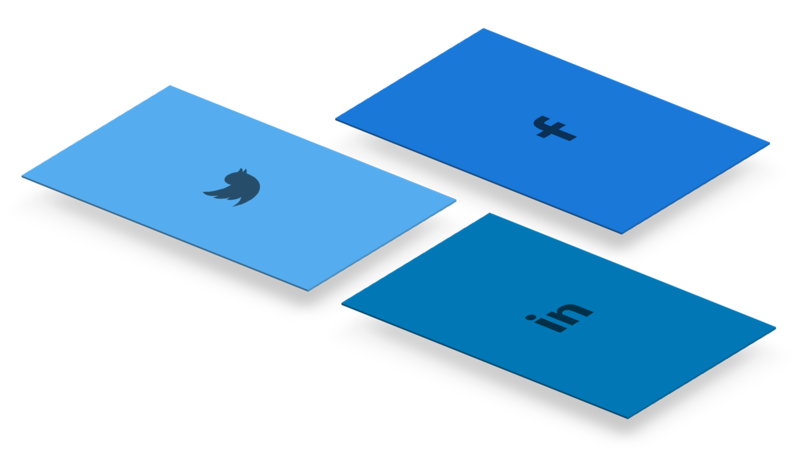 Publish to news feeds of LinkedIn, Twitter & Facebook - Once campaign is deployed you can publish the campaign link and information across all of your social accounts with the click of a button for instant traffic. Create campaign split tests for up to 5 campaigns simultaneously and a report will automatically be created revealing which performed the best across a number of different KPI's. Campaign automation allows you to create an automated sales funnel that presents lead generation offers to prospects, testimonial campaigns to leads, and referral campaigns to customers. User-generated content curation allows you to assign user photos and videos to certain campaign galleries, add them to emails and web pages, etc. Users are added to your Social CRM Database so you can identify and connect with your most influential advocates. Export a list of users for each share button. Add custom default comments to encourage positive user comments. Add a coupon link or white paper link to the user comments automatically to boost referred visits. Multi-network shares are simplified by allowing your visitors to enter a single message and share it to Facebook, Twitter, LinkedIn, Pinterest and Email. Sharing a video? We will embed your video so it plays within the social network feed. Links are tracked and integrated with your analytics software as well as our reporting dashboard. Use our default button images or upload your own to the asset library. Preview & edit how the shares will look in Facebook, LinkedIn & Twitter. Add multiple buttons per page, versus most share buttons, which can only share the entire page versus discrete content within a page. 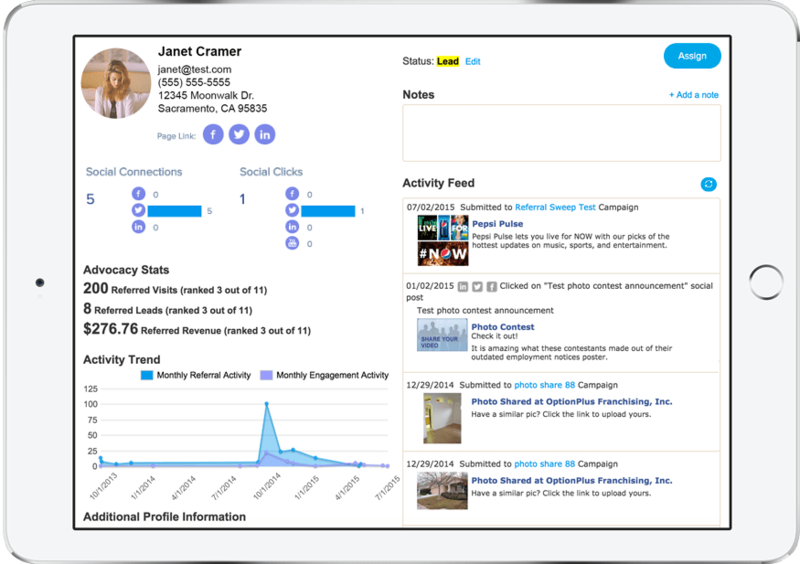 View full activity profile of each contact, including purchases, white paper downloads, referral activity and engagement activity. View snapshot of social connections, advocacy ranking and referral ranking. View trends in referral and engagement activity. Visit their social pages with one click. Assign contacts to sales team members and write internal comments on their profile page. Run unlimited reports with no added cost. Full reporting is provided for published messages, campaigns, share buttons, videos and an organizational overview. Optimal publishing times report shows you when to post to optimize clickthroughs, leads or sales for each social network. KPI's include revenue, # of sales, leads, referred visits, engagements, comments, shares / retweets, and likes / favorites. View reports in chart view or data view for more detailed analysis. Export any report for editing in MS Excel or output as a PDF for sharing. Video reporting quickly shows you the top 5 videos for three categories: Most viewed, most revenue and most leads. Report on video view through conversions or click through conversions. Overview report is one of the primary reasons to use Sociamonials. 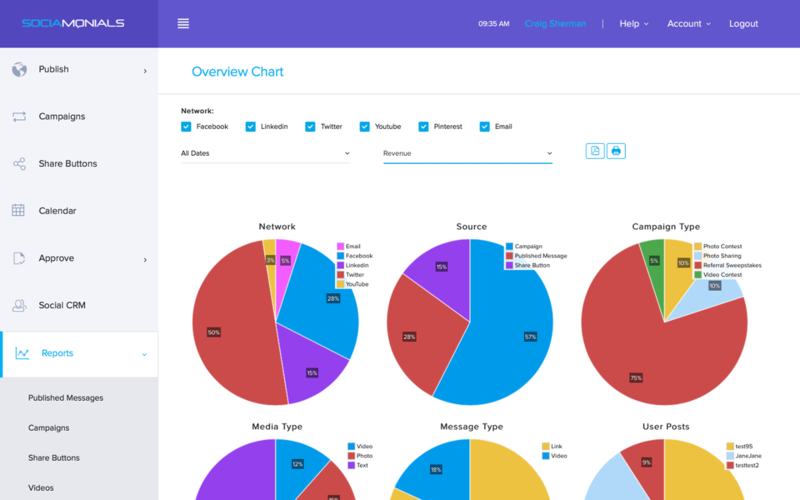 Because you are using one software tool for your social programs, you can see at-a-glance which networks, media types, employees, campaign types, etc are driving KPI's like revenue, leads, visits and engagement. 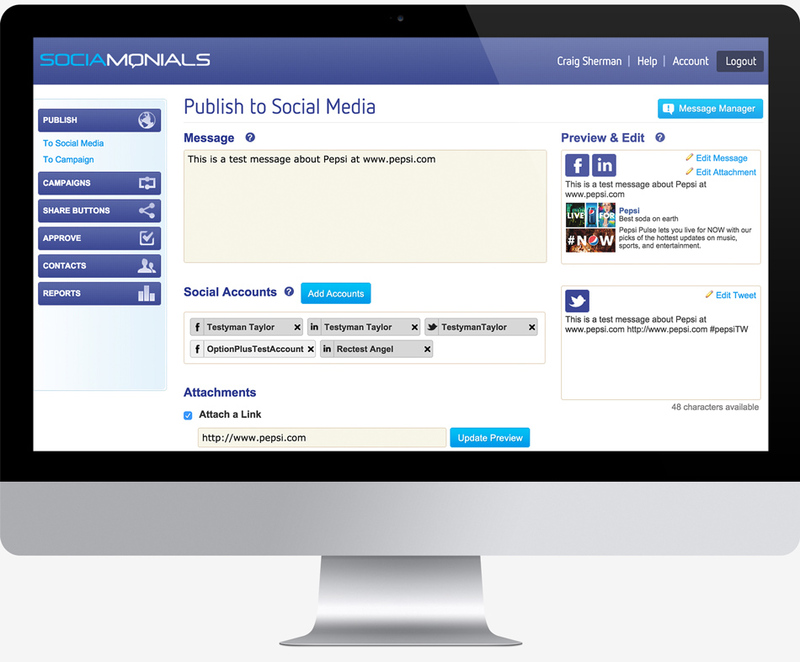 Starting social conversations is what we're all about, so our social media publishing tool is exceptional. We also understand that enterprises require approval routing, archiving, password protection, streamlined workflow, scheduling and other features to keep things running smoothly.